But my mom knows me as Gabriel Lisboa, creative copywriter based in São Paulo. Quer saber mais um pouquinho dessa história? Clica no Sobre/About. Mas eu sei que você prefere ver meu trabalho antes. Então é só scrollar a página. A gente se vê de novo no fim da rolagem, beleza? Espero que goste. Do you want to know a little bit more about myself? Click on About. But I know you'd rather see my work before. Then just scroll down this page. We'll see each other again when this page's over, ok? I hope you like it. Imagine viajar por milhares de anos-luz para finalmente encontrar… uma tecnologia mais avançada do que a sua? Nessa campanha, colocamos o New Fiesta, vencedor de todos os comparativos, contra o único adversário que sobrou: uma nave especial. Imagine traveling through thousands of light-years and finally discover… a technology more advanced than yours? 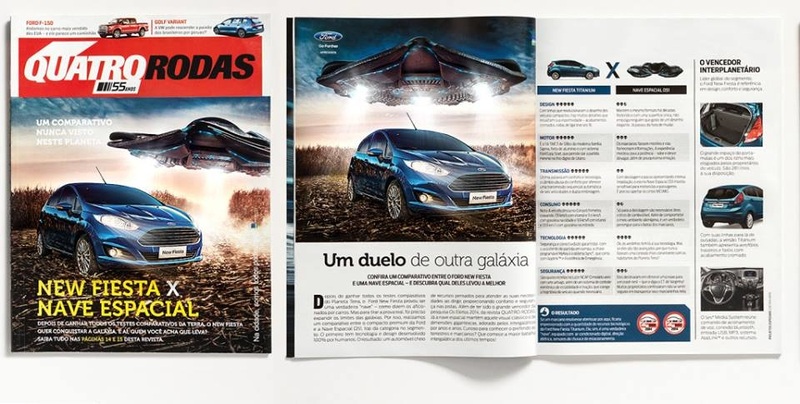 In this campaign, we put the New Fiesta, winner of all car comparisons, against the only worthy adversary left: an alien spaceship. For the third year in a row, Ford chose to tell this car’s story through a Hollywood cinematographic language. My first job here was to come up with the setting for this. With the “alien invasion” as our main plot, I wrote the TV spot, and helped my creative partners with the rest of the campaign, like web only films, a special comparison between the car and the alien spaceship in a car magazine, and digital media. We were also able to create branded content with Porta dos Fundos, a very popular YouTube channel in Brazil. In the end, the New Fiesta’s place as the best and most technology equipped car in its’ category was cemented among the target audience. Qual foi a sua maior conquista na vida, tirando os prêmios publicitários? O Novo Ka chegou ao Brasil para ser o carro de quem sempre lutou por tudo na vida. Para celebrar esse espírito, convidamos pessoas para contarem as histórias de suas maiores conquistas. As melhores foram escolhidas e contadas por Lázaro Ramos em episódios semanais, usando projeção mapeada, atuação sincronizada e planos sequência. What is your life’s biggest achievement, excluding ad awards? The New Ka arrived in Brazil as the car for those who always fought for everything in their lives. To celebrate this spirit, we invited people to tell the stories of their biggest achievements. The best were chosen and told in weekly episodes by a famous brazilian actor, Lazaro Ramos, using mapped projection, synchronized acting and long takes. My job was to come up with launch idea for the car, concept, website copy and digital media. The web films execution were made in partnership with the whole creative team and the technology production company. By the end of the year, the sales’ goal for the car launch were met, and the campaign was successful in cementing the New Ka’s place firmly in its’ category. 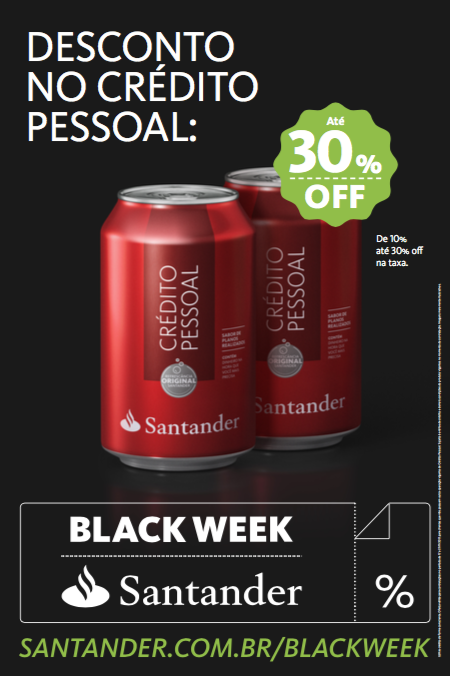 Um job como ninguém nunca viu: em 2017, o Santander colocou alguns de seus produtos como empréstimos, crédito, cartões, conta corrente e investimentos com ofertas im-per-dí-veis e dignas de uma Black Week. Mas espere! Para uma promoção de varejo de verdade, também criamos produtos de verdade! Com embalagem, rótulo e tudo, para você ver, pegar e ler! Mas não terminou! Para divulgar os produtos e as ofertas, criamos a maior campanha de varejo para um banco na história! Recrutamos um dos maiores nomes do varejo no Brasil para ser nosso garoto propaganda e criamos um imperdível comercial para TV. Não termine de ler agora! Também produzimos material impresso de varejo, como tablóides e anúncios! Mas ainda não acabou: Embalagens tão especiais mereciam uma atenção especial: chamamos um YouTuber especializado em unboxing para abrir e comentar CA-DA UMA da uma das 37 embalagens. Aproveite para ver esse job abaixo agora, porque o prazo para produzir foi limitado! 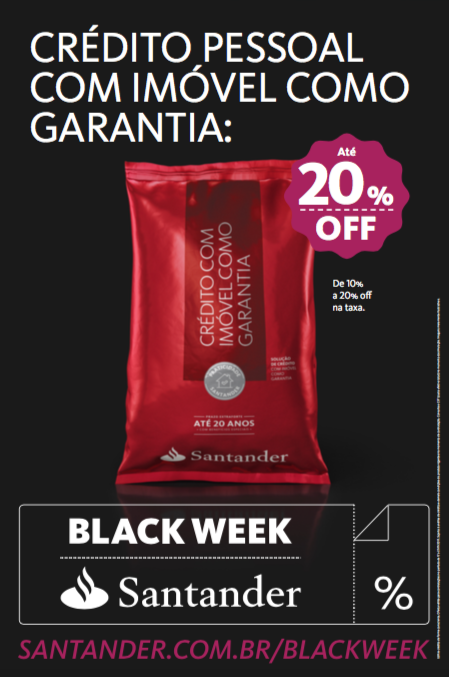 A job like no one had ever seen before: in 2017, Santander put some of their products like loans, credit cards and investments with can't miss discounts worthy of a Black Week. But how would we materialise this? Our team decided to create real packages for each one of these products, just like a true retail promotion. From that point on, my main job was to write everything that would go on the package labels, the TV spot, retail print adverts, web commerce site and dozens of special YouTube unboxing videos. The results went through the roof. Every single goal was met, and Santander enjoyed a 433% weekly revenue raise, compared to the previous year. Certain products had a 3600% raise in sales. Beyond the numbers, the campaign was very successful in helping the target audience understand the whole product portfolio of the bank. Tudo o que fazemos na vida, conta: um happy hour numa segunda, as noites perdidas na faculdade, tomar um pé na bunda em plena viagem, aquela concorrência de final de ano, uma roadtrip com seus melhores amigos… A soma de todas as nossas histórias e experiências de vida tem um nome: Quilometragem de Vida. A partir desse conceito criado para o Ford EcoSport, um carro que inspira esse estilo de vida explorador, desenvolvemos um aplicativo para Facebook que usava dados do perfil do usuário, como postagens, check-ins e outras atividades na rede social para calcular a sua quilometragem de vida. O resultado era então dividido em níveis de quilometragem, categorias e um ranking geral. Além disso, o conceito também rendeu um filme para TV e filmetes para internet, convidando as pessoas a usarem o aplicativo. Everything we do in life, counts: a monday happy hour, the lost nights at college, being dumped in the middle of a trip, that late-year prospective client pitch, a roadtrip with your best friends… The sum of all our stories and life experiences has a name: Life Mileage. I came up with this concept for the Ford EcoSport, a car that wants to inspire people to live this kind of explorer lifestyle. That was the campaign objective: reinforce this car’s proposition. To materialise it, I thought of a Facebook app that used data from the user’s profile, like posts, check-ins and other activities from the social network to calculate their life mileage. This concept was also put to work in a TV spot and YouTube films, which were made in partnership with my Copy Associate Creative Director. The app was a local hit, meeting our main KPI’s (app download and use) by a good margin, which helped solidify the EcoSport’s brand positioning within our target audience. Neste projeto para o Google, tive a chance de realizar o sonho de qualquer redator: escrever um livro. Feito em conjunto com a Pharus Bright Design, pude participar da criação de todo o conteúdo do YouTube Insights. A publicação reúne dados, insights, ideias e inspiração sobre quatro categorias fundamentais para quem trabalha com construção de marca no YouTube: Music, Cooking, Gaming e Beauty & Fashion. Agora, só falta plantar uma árvore e ter um filho. O livro teve uma edição bem limitada, mas você pode conferir o seu conteúdo aqui. In this project for Google, I fulfilled any copywriter’s dream: write a book. Made in partnership with the folks from Pharus Bright Design, I had the opportunity to create all the content for Google’s new book, YouTube Insights. This publication gathers data, insights, ideas and inspiration about four fundamental categories to anyone working with brand construction in YouTube: Music, Cooking, Gaming and Beauty & Fashion. Now, all I have to do is plant a tree and raise a child. The book had a very limited edition, but you can see the whole content here. In portuguese only, sorry :(. Deu problema no job? Vai ter que negociar prazo porque o cliente gongou tudo? E aí Tatá, #comofaz? Faz um 21! No final de 2012, a Embratel queria divulgar seu 21. Mas, como disse, era 2012: não dava para pedir que o pessoal ligasse apenas para desejar Feliz Natal e Ano Novo. Então pedimos para que elas desembucharem tudo que estava preso na garganta. Tipo contar para sua irmã que quem bateu o carro dela foi... você. E para divulgar essa ideia, ninguém menos que a Tatá Werneck. Então, meu querido, é isso: por 21 centavos você podia ligar ilimitado para qualquer fixo do Brasil e botar toda a culpa na criação que não seguiu o brief. Vai lá meu filho, junta as moedinhas da pizza da madrugada e resolve esse problema! Job problem? You’re going to need to renegotiate deadlines because the client hated everything? So, #whatdowedonow? Do a 21! When 2012 was nearing its end, Embratel, a landline home phone service provider, wanted to communicate its service, called "21". But, as I said, it was 2012: we couldn't just ask people to call everyone wishing a Merry Christmas and a Happy New Year. We asked them to call their relatives or friends to get off their chests whatever it was that they were holding back. And to do so, we used Tatá Werneck, a famous brazilian comedian/actress. I wrote four of the six web films, which were greatly played by Tatá, who had total freedom to improvise. Although we already lived in a smartphone society in 2012, Embratel was able to meet its’ landline numbers goals for the holidays. So, who you gonna call? Ghostbusters! “Quando o cliente vai dar resposta?”, “Quem vai ser o novo diretor de criação?”, “Vai ter festa de final de ano?”. Já imaginou ter um canal inteiramente dedicado a responder as suas maiores dúvidas? Foi isso que a Ford fez. Durante o Salão do Automóvel 2014, desenvolvemos uma plataforma em que os consumidores, fãs e entusiastas de carro podiam enviar suas perguntas sobre a Ford. As respostas ainda poderiam vir em diferentes formatos: texto, foto, áudio e vídeo. Para uma empresa que nunca havia falado com seu público, abrir as portas foi uma test-drive que valeu a pena para marca e consumidor. “When will the client answer?”, “Who’s the new creative director?”, “Will we have an office holiday party?”. Have you ever thought of having a channel dedicated to answering your biggest doubts? That’s what Ford wanted to do. 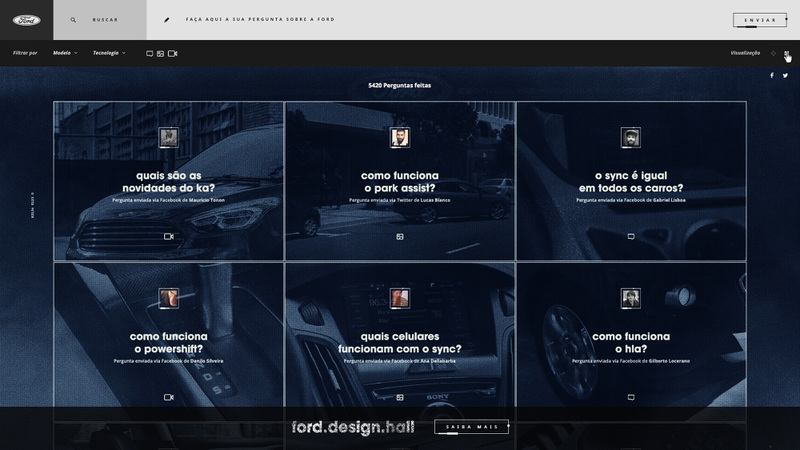 So, during 2014’s São Paulo International Auto Show, we developed a platform where consumers, fans and car enthusiasts could send their questions about Ford. I came up with the project’s name and copy for the whole platform. For a company that had never spoken to its public, opening the doors was a test-drive that was worth it for both brand and consumers, while most of the project’s KPIs were met (website hits and questions sent). Para lançar no Brasil uma loja online de aplicativos exclusivos para um navegador, primeiro precisávamos ensinar ao cara que ainda usa Internet Explorer (sim, ele existe) o que exatamente é uma loja online de aplicativos exclusivos para um navegador para então mostrarmos a ele como isso pode ser algo bem legal. E como fazer isso? É só chamar celebridades de cada área para contar, de forma prática, fácil e rápida que a Chrome Webstore nada mais é do que a Ponto Frio que ele visitou a vida inteira. Só que, neste caso, online com serviços exclusivos que o mostram como é fácil a vida de quem usa Google Chrome. To launch Google Chrome’s app store in Brazil, first we knew we had to show the kind of guy who still used Netscape what exactly was a web browser app store and how cool that was. We decided to use celebrities and ambassadors from each area to tell the target how easy to use the Chrome Webstore is. The campaign was made of web films and digital media, which were written and developed by me. The rest is history: the Chrome Webstore had a big role in making Chrome the most downloaded and used browser in Brazil. Redator sem trocadilho é como Claudinho sem Buchecha. Não confie em redatores que dizem não gostar desses maravilhosos jogos de palavra. É por isso que sem vergonha alguma, eu crio, desenho e reúno os melhores em uma página do Facebook. O amor é tanto que, com a ajuda da designer Denise Saito, imprimimos e montamos uma limitada publicação independente com uma seleção das maiores pérolas. Não é pavê, mas são mais gostosos do que os trocadilhos de tiozão. A copywriter who doesn’t pun is like a bodybuilder who doesn’t even lift, bro. Don’t trust one who says he’s not really into the greatest wordplay game. That is why, without any shame whatsoever, I create, draw and gather the best ones in a Facebook page. I love them so much that, with the help of designer Denise Saito, we printed out a limited independent edition with a selection of the greatest double meaning jokes ever. Just one small problem: they’re all in portuguese :( But if you really like puns, hit me up, and I’ll send some english pun love your way. Casey Heynes é um garoto australiano de 16 anos que sofreu bullying a vida toda por ser gordo. Zangief é um lutador russo de 35 anos que fez ursos polares sofrerem bullying a vida toda como forma de treinamento. Mas o que eles tem em comum? Duas palavras e um alfabeto inteiro de dor: pilão giratório. Sendo provocado mais uma vez, Casey explodiu. Aplicando o clássico golpe de Zangief, uma nova lenda nascia: o Zangief Kid. Bullies, cuidado. Tem um novo herói no pedaço. E ele não é o capitão do time de futebol. Zangief Kid The Game - Play now. Casey Heynes is a 16 year old australian kid who got bullied all the time for being fat. Zangief is a 35 year old russian wrestler who bullied polar bears all the time for practice. But what do they have in common? Two words and a world of pain: spinning piledrive. Being harassed yet again by a school colleague, Casey decided he had had enough. Executing Zangief’s trademark movement, a new legend was born: the Zangief Kid. This game, a side project developed with a number of friends, is our tribute to him. Bullies, beware. There is a new hero in town. And he is not the captain of the football team. Olá, tudo bem? Você já digitou meu nome, então vamos pular essa parte. Eu sou redator publicitário, natural de Salvador. Como você deve ter percebido, eu sou da Bahia, por isso o meu apelido super original: "Bahia". Foi depois de me formar em publicidade e propaganda que decidi me mudar para São Paulo e dar um gás na minha carreira..
Dez anos se passaram, e desde então eu já tive a oportunidade de trabalhar em lugares incríveis como a CUBOCC, JWT, Neogama/BBH, Young & Rubicam, Africa, Mutato, Cheil e Suno United Creators, além de poder trabalhar para grandes marcas como Kraft, Unilever, Google, YouTube, Ford, Renault, Itaipava, Budweiser, Brahma, Santander e Samsung. O melhor disso tudo você vê aqui nesse site. E agora, enquanto você lê isso, estou trabalhando na Leo Burnett Tailor Made. Do que você precisa? Se for um conceito matador, eu vou criar um e treiná-lo a usar uma faca. Um baita título? Eu vou escrever até termos um digno de título. Taglines, manifestos, folder, flyers, cartas, e-mails, seja lá o que for. Também trabalho em projetos com uma pegada mais verbal. Coisas como: tom de voz, conteúdo ou identidade verbal. Não tenho filhos, mas sei como dar o nome ideal para a sua marca recém-nascida e ainda ensino ela a escrever. Independente do tipo de trabalho, eu acredito que a publicidade, se feita do modo certo, pode ser uma das profissões mais recompensadoras que existe. Pessoalmente, eu sou louco por esportes. Eu realmente acredito que o esporte tem o poder de trazer o melhor de nós, seja como indivíduos ou como sociedade em geral. Por fim, eu escrevo, leio e falo português, inglês e baianês. Se quiser trocar uma ideia sobre trabalho ou esportes, é só entrar em contato. Hello there, how's it going? You’ve already typed my name on the link, so let’s skip that. I’m a creative copywriter from the brazilian state of Bahia - hence my nickname: "Bahia". After I majored in advertising in my hometown, I moved to São Paulo to get my career going. Ten years have passed, and since then I've had the opportunity to work at amazing places like CUBOCC, JWT, Neogama/BBH, Young & Rubicam, Africa, Mutato, Cheil, Suno, among others. While at these places, I worked for brands like Kraft, Unilever, Google, YouTube, Ford, Renault, Santander and Samsung. You can see it all here in this site. And now, as you read this, I’m currently working at Leo Burnett São Paulo. What is it that you need? If it’s a killer concept, I’ll teach one how to use a knife. Or maybe it’s a great headline. In this case, I’ll give you one so good it could headline at Coachella. Taglines, manifestos, folders, flyers, letters or e-mails can also work in projects like brand voice tone, identity and content creation. I don’t have kids, but I can name your newborn brand and teach it how to write. Whatever the job is, I believe that advertising, if properly executed, can be one of the most rewarding professions there is. On a personal note, I'm passionate about sports. I truly believe sports have the power to bring the best of us, both as individuals and as a society. Lastly, I can write, speak and read in portuguese & english, and if you want to talk to me about advertising or sports, please get in touch.